Privacy Statement Copyright 2010 by Neubauer & Associates, Inc.
To prepare the tuna, work quickly and think of slicing, not chopping, the delicate tuna. Using a sharp, thin-bladed knife and an impeccably clean cutting board, slice the tuna into ¼-inch dice. Cover and refrigerate until ready to use. Just before serving (otherwise the vinaigrette will “cook” the tuna), mix the tuna, scallions and vinaigrette. Season with salt and pepper. Dice avocados and season with lemon juice, salt, and pepper. To julienne bell peppers, halve the peppers and remove the seeds. Lay a pepper half flat, inside up, and remove the ribs with a sharp knife. Cut into julienne strips. Place the strips in a bowl of ice water to create pepper curls. 1 large seedless cucumber, unpeeled, elongated ends trimmed off. Place the ring mold in the center of a chilled large dinner plate. Using a mandoline (or a very sharp knife) cut the cucumber into paper-thin slices. Using the outside edge of the mold as a guide, make a ring of overlapping cucumber slices. 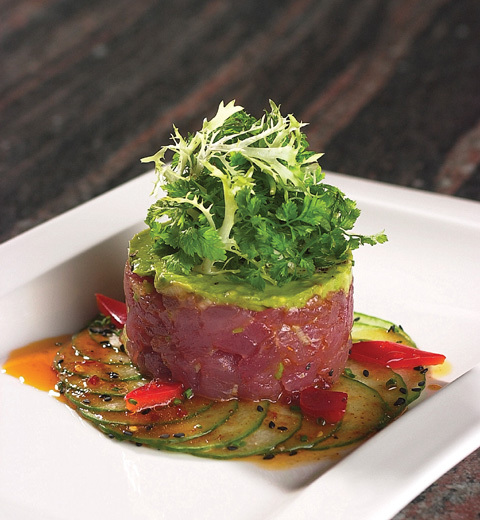 Spoon the tuna tartare into the mold, pressing it down lightly, and top it with the avocado. Pile the dressed frisee salad into the center of the avocado, and garnish it with some of the bell pepper curls. Carefully lift the ring mold up and off of the plate. Repeat with the remaining ingredients and plates. In a medium bowl, whisk together the chili garlic sauce, rice wine vinegar, and soy sauce. Gradually whisk in the oil until the vinaigrette has emulsified. Season with salt and pepper. Add additional rice wine vinegar or oil to balance the dressing, if needed.